Better late than never, right? I know, this mini album was released June 1st, but since I write all the reviews myself on this site and I do have a day job, family etc. it’s hard to keep up with all the releases. Also, a week of vacation on Sardinia, Italy didn’t speed things up either. But now I’m on it again. This is a mini album – or an E.P. if you like – and I have issues with mini albums. I never got the whole idea of making them, I mean, if you’re cutting an album then make a whole album, not just a few songs. Ah well, I guess there are good reasons for doing so and maybe it’s just me, but I really want at least 10 songs instead of only five. Exorcism is a new acquaintance for me. Formed by Serbian born lead singer and guitarist Csaba Zvekan, Exorcism feels more like a one man project than an actual band. 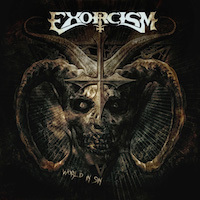 According Wikipedia, Exorcism’s debut album came out in 2006 and was called End Of Time, but there isn’t much information about it. A google search leads to their 2014 album I Am God as their debut one, which makes their new E.P. their second or third effort depending on how you look at it. What we do know is that the band is heavily influenced by bands such as Black Sabbath, Dio, Candlemass, Trouble and early Judas Priest, which of course makes this record an interesting one to check out. The whole band situation seems somewhat diffuse and even though some of the names show up as band members, the recording situation for them makes them come out more as session musicians more than band members. Andy Drake, Joe Stump and Biggie P. Phanrath hold guitar duties together with Zvekan, who also play bass and keyboards as well as being responsible for the production, mixing and mastering. Logan Christopher and Lucio Manca also play bass and there are also two drummers, Mirkko DeMaio and Garry King with Alex Wind on keyboards. The title track opens like a bat out of hell, going for the throat in a dark and heavy way. There’s a killer melody throughout the song and the Sabbath influences aren’t exaggerated by any means. “Black Day In Paradise” has a melody that is actually catchy but the overall sound of the song is really dark and evil, a contrast that sounds really cool. “Virtual Freedom” is a really fast and heavy track and if you put early Yngwie Malmsteen’s Rising Force in a blender with Ozzy era Sabbath, you might get the idea how this one sounds – awesome! “Sahara” is a good song, but it strikes me as being unfinished, or maybe like a longer intro with vocals. The mini album ends with “Black Star”, a brilliant dark, heavy, evil and epic song. And by that the record ends. And I’m pissed off! This is way too good to only be released as a mini album. With the quality of the five – well at least four out of five – songs on this record, couldn’t they just have taken their time and written and recorded five more? I’m sure the quality would still be high. As for now, the high rating doesn’t mean as much as it would have had the album contained ten songs, if you get my drift. I almost feel cheated here. It might sound like I’m slagging the guys off, but I’m really not. See, this mini album is a killer and I want more. Lots more. I’m a huge fan of Tony Martin era Black Sabbath and Exorcism is right up that alley. I have no clue of how I Am God sound, but I’m sure gonna check it out. If you’re a metal fan, into Sabbath, then don’t hesitate to get this album. One of the most promising “new” metal acts I have heard in a long, long time. This is my kind of metal.